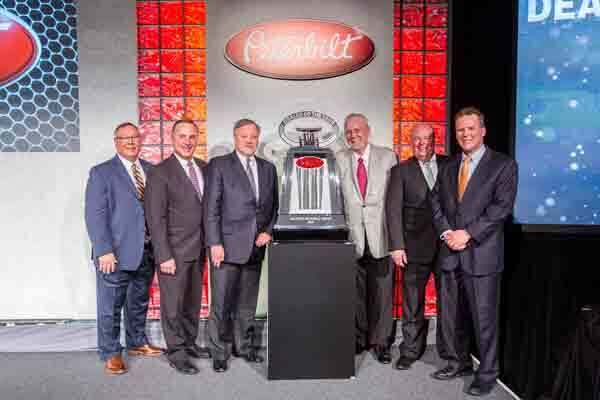 The award was presented at the 2018 Peterbilt Dealer Meeting held in Scottsdale, Arizona. The annual two day business meeting brings together Peterbilt dealers from across North America. The meeting includes presentations and breakout sessions, with focused reviews on strengthening the dealer network and providing an industry leading sales and service experience to customers. In addition to Dealer of the Year for 2017 Allstate Peterbilt also takes home the Platinum Oval award which is given to the group of elite Peterbilt dealership locations who have demonstrated outstanding performance in all aspects of the Peterbilt Standards of Excellence program, a 2017 Best in Class award which honours the dealer organizations that rank the highest across the North American dealer network, and the TRP Dealer of the Year award which honours the top performing dealer in supporting the PACCAR Parts all makes TRP brand. This is Allstate Peterbilt’s second Dealer of the Year award adding it to their 2013 award. In 2016 Allstate took home awards for Parts and Service, Platinum Oval and Best in Class. Allstate Peterbilt operates 21 dealerships throughout the Great Lakes Region and finished 2017 as one of the top performing dealerships in parts and service, medium duty sales, Class 8 sales and MX engine sales. Allstate is also one of the leaders in the Peterbilt dealer network for mobile service and is part of the Peterbilt Mobile Service Council, which develops best practices for other Peterbilt dealers to follow in developing their mobile service operations. In addition to Dealer of the Year Peterbilt also recognized the top-performing dealerships with Best in Class awards. The Best in Class Awards are based on a combination of Peterbilt’s standard of excellence scores, financial performance, part and service performance and utilization of PACCAR training and programs.